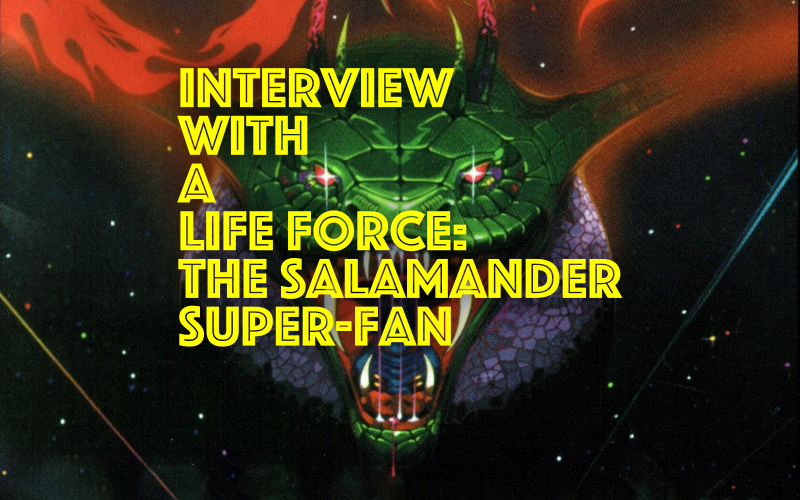 New contributor Joshua Robinson recently had the pleasure of talking with Salamander/Life Force obsessive Madd74 about his dedication to the classic shoot ’em up. 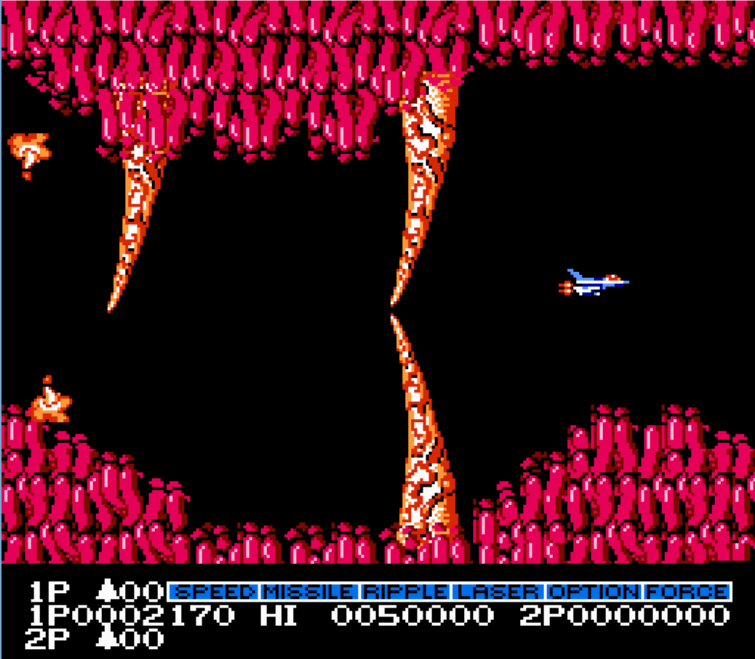 Konami’s long-running shoot ‘em up series Gradius (1985) has spawned numerous sequels, four spin-off series and marks the first appearance of the Konami code. 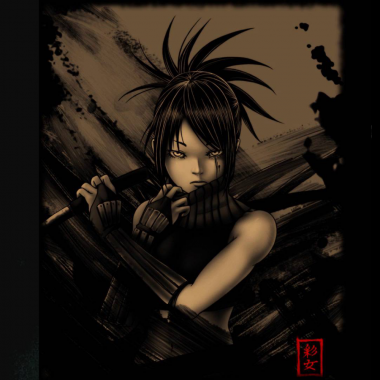 With a series that has produced so many games, it isn’t hard to find a fan of one of related titles. For Madd Martin Kroeger – aka Madd74 – his lifelong infatuation belongs to the spin-off, Salamander. Debuting in Japanese arcades as Salamander in 1986 then re-branded as Life Force (or Life Force: Salamander) for its Western releases. JR: Would you call yourself a Life Force collector? Madd74: I would absolutely call myself a Life Force collector. I have an unopened box NES version that cost over $1000. One of the biggest things I was hoping for on Reddit was to go to a Life Force subreddit, and when I saw it was not there, I made the /r/gradius subreddit and filled it with information on every single game, and then plugged it with music and more. My car and my work music playlist is composed of a lot of Life Force/Salamander music, including remixes of original BGM. JR: How many copies do you own of the game? Madd74: I own an open box copy, as well as the closed copy I mentioned before. I own a Japanese import physical copy on the PSP (called Salamander Portable). I then have digital copies on my Wii, Wii U, 3DS, and PS4. I even have a Japanese Android third party game that is an HD remake of the NES Life Force. JR: What is the best version in your opinion? Madd74: ‘Best’ version is difficult. In terms of overall game, I would say the NES Life Force. Why? Because it’s actually possible to beat this game, even without the Konami Code. I also grew up with it and put the most time in it, even though American arcade Life Force was obviously first for me. However, I have an extreme fondness for the Japanese arcade Life Force. It gives you the power up capsule of the NES Life Force instead of the actual power up item (speed up, laser, option, etc). Also, unlike the NES, you get four options instead of two. Who doesn’t love all that extra firepower? Madd74: I never really got around to getting any other physical memorabilia, however, there are some things I have been meaning to get, especially the Yu-Gi-Oh! 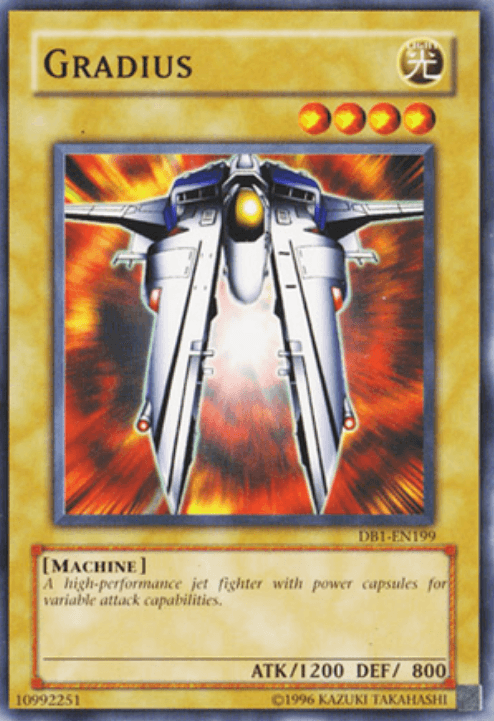 trading cards that include Gradius things, such as the Vic Viper, Options, and more: http://gradius.wikia.com/wiki/Yu-Gi-Oh! Also, I have invested some in the spin-off games. I have bought the 360 Otomedius Excellent, the Parodius Japanese import game for PSP, and Gradius Gaiden on Japanese import for PS1. JR: How much money have you spent on the game? I don’t need an exact estimate. Does this include pumping quarters into the Life Force arcade machines? Madd74: Over my lifetime I would have put in over $1500. This includes quarters, the sealed copy, my NES copy, and the ‘virtual’ ones for the various consoles. JR: Are you one of the 14 people that own a Salamander arcade cabinet / motherboard? Or one of the 14 people that own a Life Force arcade cabinet / motherboard. Only one of which is an original cabinet. Madd74: I unfortunately am not one of those lucky 14 people, I only wish I was. JR: So what was it about Life Force that resonated with you this much? Was it one moment that always grabbed you or just love the core gameplay loop? Madd74: When I was much younger, I would play Life Force when it came out in the arcades, because I am old enough to know what an arcade is, and old enough to be able to play when the game hit the arcades in 1986. I spent a lot of time in the arcade attempting to beat that game, even though I never ended up beating the arcade version back then. There was a time when I had an injury that made it so I could only play with one hand. When this happened, my mom decided she would smash on the fire buttons while I flew the ship. So I think a lot of my love for this game came thanks to those arcade memories, and remembering my mom being there for me like that. When the NES came out, and I found out there was a Life Force game for the NES, I saved all my money from my allowances to get the game, and my parents surprised me due to my “good behavior” by actually getting me the game when I got my NES, so Life Force was the very first game I bought on NES. It was one of the few videogames my mom would play with me. JR: Do you also have equal amounts of Life Force 2 or Gradius memorabilia? Madd74: It took me a very long time to realize there was a Salamander 2 game. Also, I got into the other Gradius games after Life Force. So I do not own as much stuff for Salamander 2, however all my other Gradius stuff combined surpasses Life Force, but only because there are a lot of other games out there. 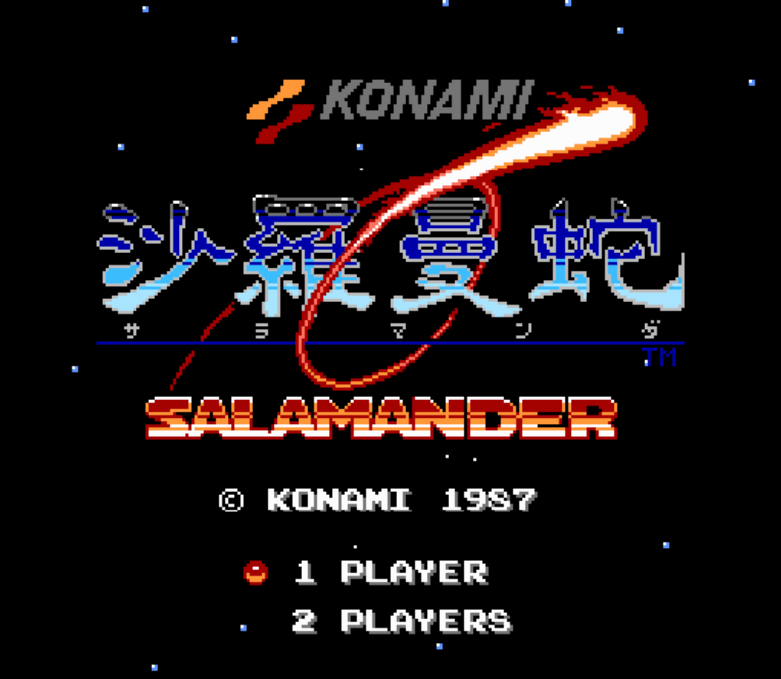 I have played the emulator of Salamander 2. After you beat it and loop, they play the classic Power of Anger (level one NES) as well as Planet Ratis (level three NES) from Life Force. JR: You probably don’t know this, but it’s worth asking. Do you know if the developers have ever seen a salamander? The box art is not what a salamander looks like. Madd74: Hahaha, no, I have not spoke with Hiroyasu Machiguchi or anyone else behind it, however you are correct, that definitely is not a salamander. Welcome to the wonderful world of Japan! JR: Would you call yourself a Life Force expert? Do you have any expert strategies? Madd74: Yes, I actually would call myself a Life Force expert. There have been times I have been able to beat the NES version without losing a ship, even though I really could use some more practice these days. As for strategies, if you are playing the NES version you can always put in the Konami Code (up, up, down, down, left, right, left, right, B, A). If you are playing multiplayer, you have to hit Select first to put it on two players, and then do it. I generally recommend two speed ups, as this will allow you to easily get away from the bosses. The game will start you off with 12 power ups. Depending on your play-style, you should have missiles, option, laser (level 1), and speed up. There are 29 total power ups in the first level, but most people are not going to be able to get them all. By the time you hit the first boss (Brain Golem) you should have two options, shield, missiles, and laser. Also, in the NES version the ripple laser is useless compared to the normal laser. 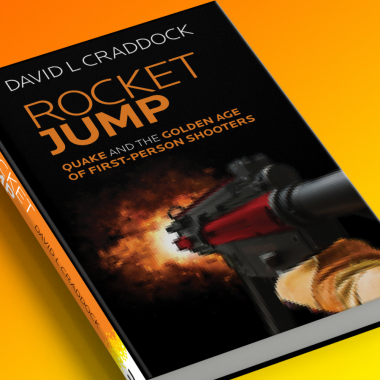 Life Force physical objects obey what I call Gradian law: if you can shoot past a solid object you can fly through it, meaning if you are shooting and your laser/bullets do not pass through the object, your ship is not going to pass through it either. There is also a fun game within a game I like to play on level 4 (Organic Speed Zone) when you get to the boss, Giga. After taking so many hits, the eyes will come after you. When you see the first eye detach, fly up to the top of the screen. When the second eye comes after you, the bullets from the mouth will continue to fire towards the direction you are. This is what I had to do to enjoy Poison of Snake on repeat when I first played this on the NES, since there was no Internet, and getting game music was not easy back in the late 80s. JR: How many times has the Vic Viper been destroyed under your control? Madd74: I have been flying the Vic Viper since 1987, and there are times I have crashed it on purpose. Add 30 ships via the Konami code, and a huge span of games (including Otomedius and Parodius). The arcade game has probably seen the most destroyed without trying to destroy them. Gradius V, once you loop it a few times, sees the poor ship destroyed constantly. I have selected the Vic Viper in Parodius many times also. I am more than certain I have destroyed that ship over 10,000 times. JR: Are you sad or happy that only Gradius and not Life Force is featured on the NES Classic so you don’t have to track one down? Madd74: I am sad that Life Force is not included on the NES Classic, only because it means more people would be experienced to this awesome game, with one of the best soundtracks I have ever had the pleasure of listening to. The NES version of Life Force happens to be the ‘easiest’ of all the Gradius-like games to play and actually beat without having to continue. Of course, Life Force would be the sole reason I would buy a NES Classic, but since it is being re-released by Nintendo, I would probably been able to track one down. JR: There is a three volume Salamander anime. Have you seen it? Madd74: I actually posted the link to that on the /r/gradius subreddit. I did so when Castlevania came out on Netflix and caused a huge re-interest [sic] in Castlevania, hoping that somehow, somewhere, someone from the Netflix world would see that it was a thing and maybe bring the series back. 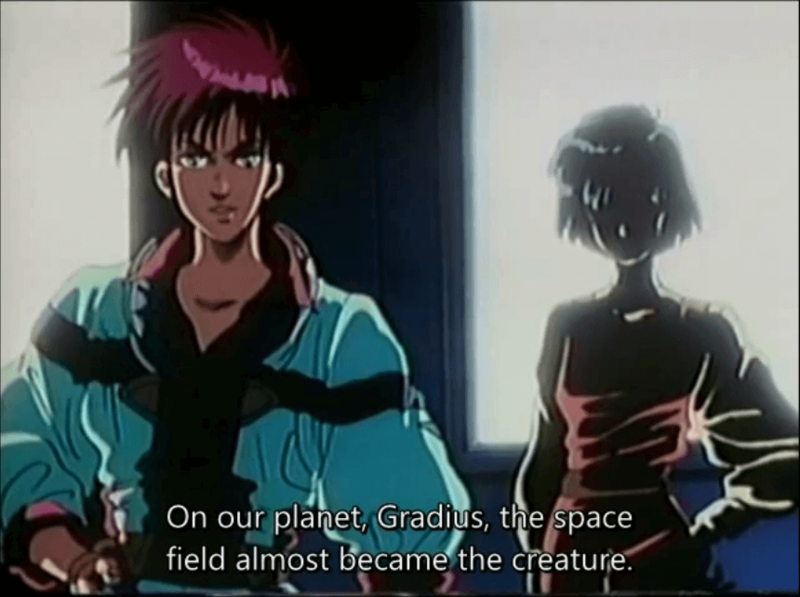 The three OVA are loosely based on Salamander, Gradius I, and Gradius II, however the Power of Anger BMG (level 1: Bionic Germ) and Poison of Snake (boss BMG) can both be heard at some point in the first one. It was ages ago, however I saw the first one, and I don’t remember if I caught the other two. All three are actually available on YouTube, running around 51 some minutes a piece, in Japanese with English subtitles.